What are the best features to have in your lone worker app? With so many people working from home these days or doing jobs where they are away from their colleagues, lots of lone worker solutions have sprung up. How do you know which one is best for you and your needs? We have put together 5 key features you need to ensure your lone worker safety! Great apps have a system that notifies you when you need to check in with your work place. 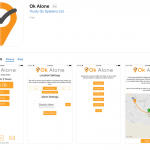 Notifications should pop up on your Android or iPhone screen reminding you to tap the app and let your base know you are ok.
Make sure the lone worker app you choose has GPS tracking that can give your real time location in an emergency. Great apps will have a few settings so you can choose how often you want to be tracked. Being able to change the time between check in’s if you are going into a situation you deem high risk is important. You should have an app that allows you to select the frequency of your check in, changing from 2 hours on a normal day to potentially every 10 minutes in a high risk situation. Choose an app that doesn’t need to be ‘open’ to work. The best app’s feature background mode where the solution is running without it having to be constantly on the screen. An app that drains the charge on your battery is not going to help keep you safe! In order to have your phone as a life line throughout your shift, you need to choose a lone worker app where running it won’t mean running down your battery too.